Back in September last year, I wrote this article about accessing FTP sites using Windows Vista. I then completely shifted to Windows 7 (starting from M3 Build which was released at PDC 2008) only to find out that I couldn’t get the FTP site location thing to work in Windows 7 as it did for me in Windows Vista. This functionality was probably broken or disabled by Microsoft on purpose for testing in all the builds up to Windows 7 Build 7057. But starting from Windows 7 Build 7077, this has been fixed and you can now access any FTP site from within Windows 7 itself without having to install any third party software. Step 1: Click on Start Orb and then click on "Computer". 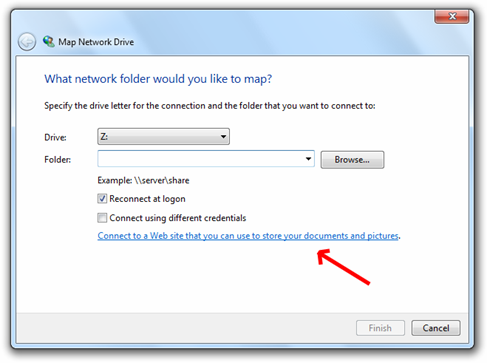 Step 2: Click on “Map network drive”.. 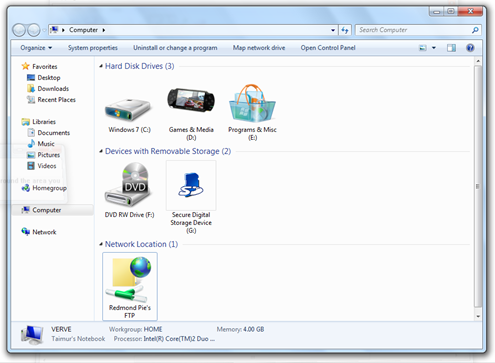 Step 3: "Map Network Drive" window will open. Now click on the link "Connect to a Web site that you can use to store your documents and pictures." Step 4: Now simply follow the step by step wizard to add a new network location. Select"Choose a custom network location" when given the choice of where to create this network connection. Step 5: Type your ftp address e.g. ftp://ftp.yoursite.com. Specify a user name and password if required. Step 6: Last but not the least, give your newly created network location a name and you are done! Feel free to ask me any question should you run into any problems setting up your FTP site in Windows 7. @Greg: Its very strange. Its working abosolutely fine for me on one PC but giving me “The handle is invalid” error on the other one :S .Both running Windows 7 Build 7100. I am still completely unable to upload on Build 7100. Have not had a chance to test another machine (only have one PC running 7). @ Taimur – are there any differences in the PCs? Win 7 64-bit build 7100 here, on an Intel Core i7 chip. I have yet to be able to upload an FTP file to any site. I am running Win 7 x64 RC (Build 7100). Intel E8500 processor. Wired ethernet connection. No luck uploading FTP via explorer. This exact same machine and setup had no problems uploading FTP using Vista 32 or 64 (Ultimate). I really hope that this type of bug does not make it into the RTM. @Yums: I’m not sure. Its a weird problem. Working on some installations while not on others. Hope they fix it soon! Thanks. I was looking for a way to access some Linux machines on my LAN via Explorer in Windows 7, and this does the trick. Now I can copy and paste files between machines. I never would have thought to look under Map network drive. When I follow the instructions above Windows 7 adds a bunch of crap to my ftp address, such that it can't access it. It will not allow me to manually change the shortcut to the correct location. I wish I could go back to XP where things actually worked. Thanks – it worked just like you said. Hi, David, I encountered a similar problem. Do you have an FTP ID that is formatted like this: userID@domain.com ? If so, just provide the userID part when setting up the connection initially. When you actually connect to the site then use the full userID@domain.com ID. That worked for me. I can do this in gnome on linux because within gnome a program is provided access to the filesystem via the gnome virtual file system (which handles the get and set of files). this means i can map a network drive (or mount in *nix speak) to a local folder and treat the remote location as if the files were actually local. currently using windows explorer i have to first copy a file from the remote location to the local file system before i edit the file. I would prefer that windows explorer transparently handle this step and just let me open and edit the file. 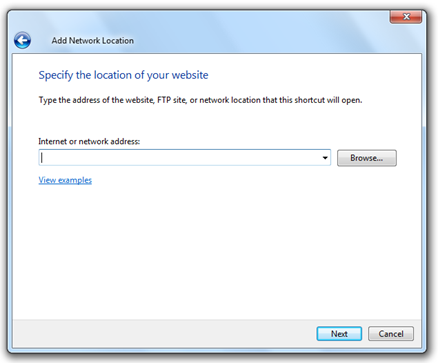 I followed these steps but when clicking on the connection, it goes to open my FTP site in Internet Explorer. Where do I change the app to have it connect through Windows Explorer? Great. This worked very well for me. Thank you so much, I tried to use the Microsoft Help stuff… nightmare. Your article was simple to follow and very helpful, thanks again. It workd well for me in XP using Front Page, but not in Windows 7, nor does Expression Web 3. It opens in the format you describe and thats how l set it up. I get cant find web server errors in both programs. Microsoft has no info on this fix. Thx for posting these instructions. I was able to setup my drive and copy files using your instructions. However, I'm having a problem when I try copying a large number of files. The connection times out in the middle of the copy. The estimated time to copy was 40 minutes. I stepped away from the computer and when I came back it had timed out and I could not figure out what files had completed copying and which still needed to copy. So, I tried it again. Same results the 2nd time. Is there any way to set the timeout limit so that it won't timeout on me? Does anybody have any idea what to do!? I've literally tried everything…Baffled. I assume that this ftp technique will not allow me to change the file permissions on the server? In other words, what you have described here does not seem like advanced ftp. Back when using WinXP I used this method to access my remote files. I had completely forgotten about it so THANKS!! :o) nice tutorial also! for those saying it does not work. Win Vista, and Win7 x64 working just fine. You are my savior! 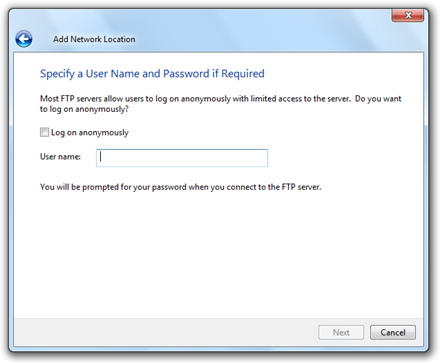 I tried accessing my FTP by mapping it in Win7 but it never let me add it and says it cannot be found. But it is found when i type the ftp address into windows explorer. Wonderful! Exactly what I was looking for and worked perfectly. yes, is there some way to edit the remote files as if they are local, without the extra steps of downloading and uploading? How do I access this connection from dos? I receive an error message in step 5: invalid folder name. What else should I define? Worked a treat for me. Thanks very much! This does not map the site onto a drive letter, which makes it problematic at best.